In our hectic lifestyle, often our workplace is the source of a lot of pressure and workload. 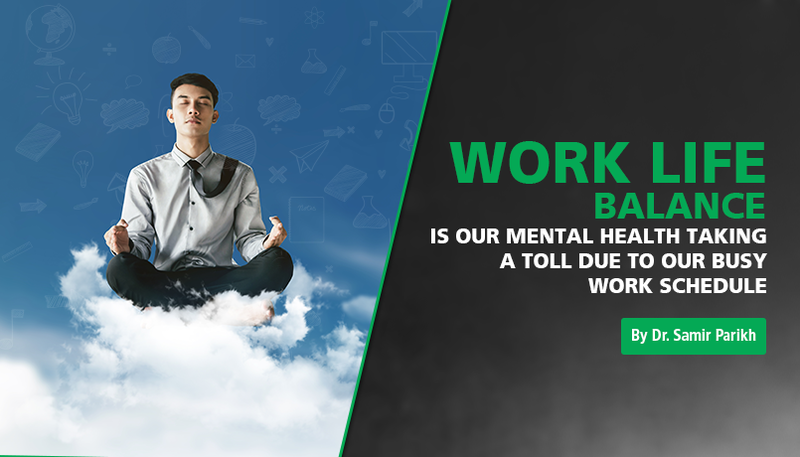 We need to learn to maintain a balance, not letting our work stress permeate into our personal lives and vice versa, while at the same time ensuring to keep in mind the following steps to maintain our psychological well-being at the workplace. 1.Time management. Effective time management is the key to staying mentally healthy. Make it a point to disconnect from work on the weekends. It is important to set realistic goals, prioritize tasks and maintain a balance between demands of work, family as well as personal life. This is important to ensure a stress free life both at home as well as at work. 2.Ensure that you build support systems at the workplace. A lack of social support could serve as a major source of stress at the workplace. Enjoy some time with your colleagues outside the office environment as well. Make an extra effort to build relationships, and they shall inevitably be a good return for your investment. 3.Adopt healthy lifestyle choices. A disciplined and healthy lifestyle is very beneficial in maintaining mental health. An adequate sleep, a proper diet, and regular physical exercise would help us stay physically as well as mentally fit. 4.Avoid monotony. Often the mundane routines could become very depressing. It is useful at times to alter the physical appearance of your work station. Rearrange your desk, make efforts to brighten the room, and also try and bring changes in your work routine. 5.Allow yourself to take regular breaks. It is important to allot a ?me time?, allowing yourself to get refreshed. It is ok for you to have a ?do nothing? in your to-do list. Listen to yourself, and take time out from work and family. Planning a short vacation could be one of the best ways to de-stress! It is important to keep aside some time for a recovery period along the way, to help replenish the energy being invested by you. This is not just a reward to give yourself for your efforts, but also a necessity for you to rejuvenate and take care of your own needs. 6.Keep it simple. Try and focus on one thing at a time. Maintain clear boundaries, and work towards short term goals. De-clutter your work space, and try to keep it simple, neat and tidy. Simplicity in your work environment would prevent distractions, and would help keep you motivated to work. 7.Focus on yourself. Instead of comparing notes with others, try to focus on your own performance. Despite of living in this competitive world, it is more beneficial to be focussed on your own work and efforts, rather than trying to succeed over others. Remember your own goals and targets, and be motivated towards it. 8.Prioritize. There will inevitably be times when you have too many things to be done. Rather than getting flustered, reorder the priorities in your head, striking off the less important or urgent ones and focussing on the present instead. At times like this, it?s important to take a step back and introspect on the reasons of our actions and why we want to achieve what we?ve wanted to. 9.Have realistic expectations. Getting caught up in the hectic pressures of our work often leads us to expect too much from ourselves or from others as well. Therefore, it is necessary to be able to remind yourself to be realistic in your evaluations, so that your decisions are based on objective facts rather than your faulty and unrealistic expectations. Always keep the external factors in mind, which are not in your control, to avoid experiencing chaos and confusion at the last minute. 10.Maintain clear boundaries. Not letting your personal life mix with your professional life though sounds quite an impossible quest, actually isn?t so difficult to achieve. It is essential to ensure you have don?t let your work spill into your home life as this is likely to have an adverse influence on your interpersonal relationships. At the same time, do not let your personal problems interfere with your professional responsibilities at your workplace. 11.Don?t overcommit. Be aware of your limitations and also accept them. The goals that you set for yourself must be doable and achievable, without having excessively high or optimistic expectations from yourself. Take on only as much as you can handle, and it?s ok for you to delegate tasks to others or to be assertive. 12.Use humour. If you make an effort to find opportunities to smile and laugh often, not only would this help lighten your mood, but it will also have a positive effect on the others around you. This is the cheapest and easiest stress-buster ever. While it is easy to get trapped in the vicious cycle of a hectic routine, it is more important to remember to enjoy yourself. Look for opportunities to laugh at, and humour is a great way to lighten the mood and relieve your stress levels. Being at work doesn?t mean you cannot have fun! Posted on November 15, 2018 by Dr. Samir Parikh. This entry was posted in Mental Health. Bookmark the permalink.